This autumn has been mild and colourful. The first big winter storms are still to come. Sunny days have been warmer than many in the cool wet summer. So it was at the beginning of November when I was very surprised to find myself sitting on a summit at over 1000 metres in a T-shirt. 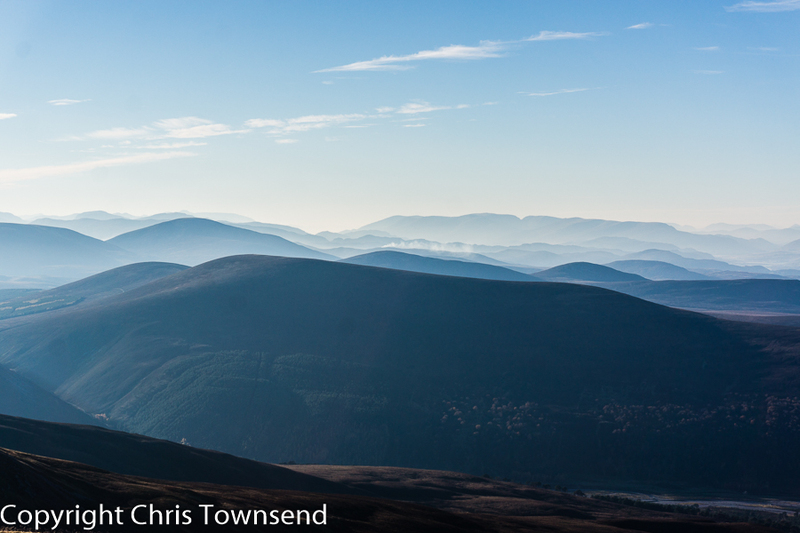 The trip began with an evening walk up Glen Feshie. 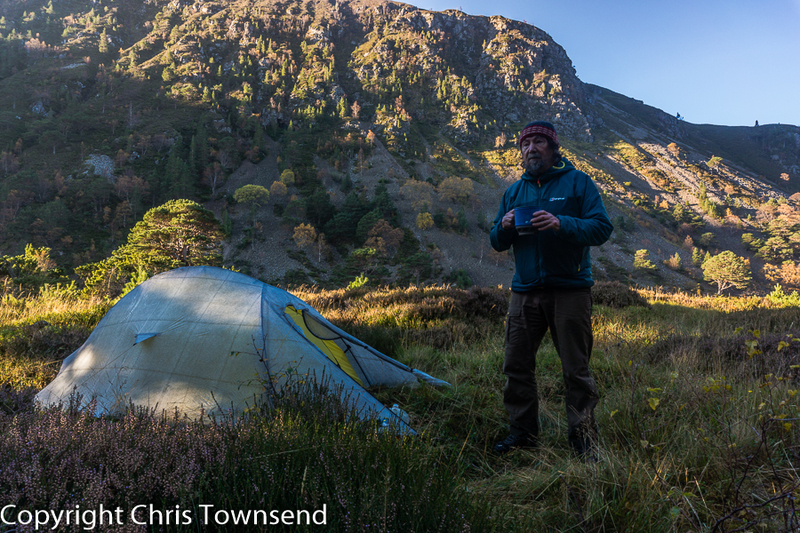 I always try and have a camp in the glen at this time of year, when the autumn colours are bright and I can camp in the forest and watch the world without disturbance by midges. 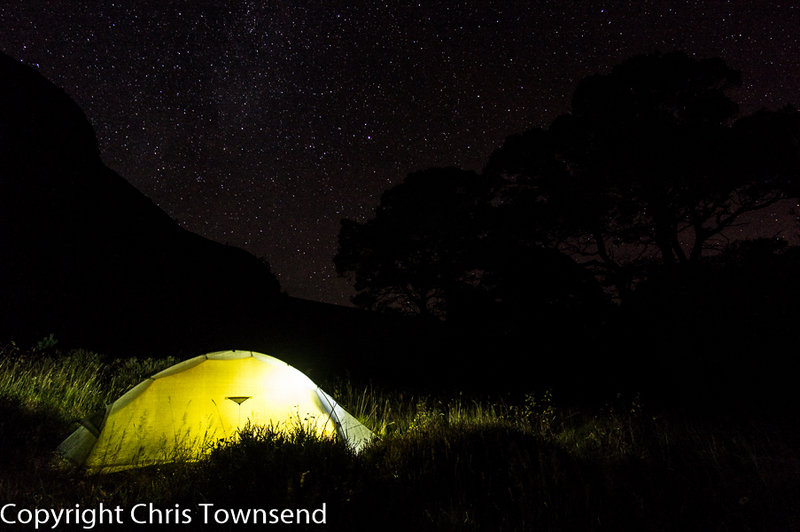 I pitched my tent just as the first stars were appearing. A cool wind rustled the trees but it wasn’t cold for the time of year. The forest at night is mysterious and beautiful and I spent some time wandering round watching the stars, the dark outlines of the hills and the silhouetted trees. Later I fell asleep with the tent doors open. A few times during the night I woke briefly and looked out at the stars. By dawn dew soaked the tent and the grass but there was no frost. The temperature was +3°C and the damp air felt chilly. The sky was clear and the sun soon touched the hilltops. Slowly the sunshine crept down the slopes and started to filter through the trees. I lingered in the glen admiring the autumn colours before starting the long climb up Mullach Clach a’Bhlair. I went via Druim nan Bo on an old sketchy path that lower down is slowly being absorbed back into the forest. It’s an excellent route though and far preferable to the standard route up this big bulky hill. 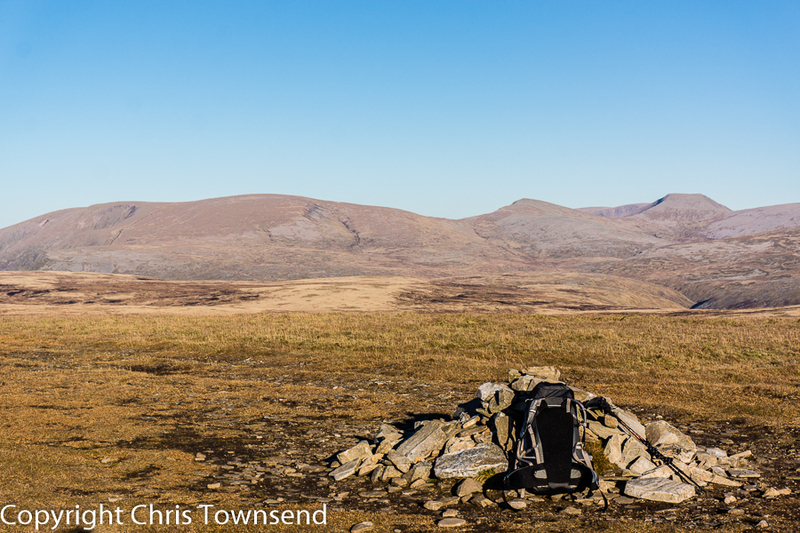 On the summit I sat and gazed over the brown and grey expanse of the Moine Mhor plateau to familiar peaks – Sgor Gaoith, Braeraich, Sgor an Lochain Uaine, Cairn Toul and more. As I walked north towards Carn Ban Mor long shadows streaked across the ground. The sun is never that high in the sky now. Out west the hazy hills were shades of grey. Ravens soared overhead and ptarmigan scuttled over the ground, their winter plumage making them stand out. Sunset came with a brief flash of colour on a narrow band of thin clouds then the sky was dark and the first stars were appearing. Back down in the forest I needed my headlamp for the last stroll back to the car. The air was still quite warm. I don’t think I’ve ever had such a warm trip at this time of year. I wonder when winter will begin. 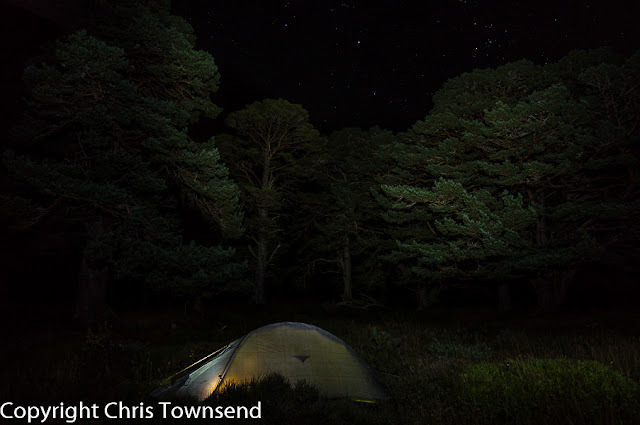 A night in a forest and a wander over a high moor, a fine combination Chris. Managed a visit here last month, a rather unconventional approach to Mullach Clach a’Bhlair from Linn of Dee before enjoying a fine camp on Moine Mhor. 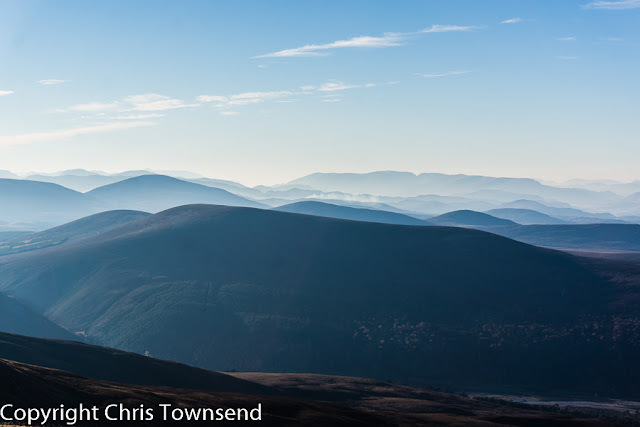 Chris, I'm thinking about Glen Feshie for a deep mid-winter backpacking trip (probably at Christmas). Does the sun reach the glen floor at that time of year (assuming clear conditions!!) or, is the valley floor always in shadow in December-January? Dave, The sun reaches some parts of the glen in midwinter. Depends where you are. Out near the river just beyond the bothy is probably the best place - the glen is quite wide there. Looks really nice. Planning on getting up there later this week although from the forecat winter might be coming. Autumn trip at its best Chris. A truly wonderful location and high tops mixed with perfect glen. Unbelievable weather for November a magical trip.